You might say it's deliciously awful. "Gods of Egypt" expresses an intense effort in its cinematography, but is accompanied by disappointing characters that are all brawn and no brain or heart. The characters are forgettable and lack substance, and the dialogue is comically bad. While early action sequences show some flair, sadly the film's third act descends into the repetitive meaningless mass destruction we expect from modern blockbusters. It's an utter failure from director Alex Proyas. It's a brutal attempt to recreate the Egyptian folklore, with disastrous results. The effort it takes to sit through this movie strains the eyes, the intellect, and the attention span. What ultimately makes Gods of Egypt such an off-the-charts bomb is that it tries to shoehorn Egyptian history and myth into the Biblical epic formula. If kitsch mythology and a swords-and-sandals clad Butler along with various bosomy lasses float your boat, it's passable. Rob Friedman: What is that supposed to be? Matt Sazama: Well sir. This is all original. We've just borrowed inspirations. Alex told us to refer to Mr Butler's DVDs but Burk got this bright idea at the video store. Yes, Gods Of Egypt is silly and fairly badly acted at times, but it's undeniably spectacular, bounces briskly along (for the most part) and never, ever falls into the trap of taking itself too seriously. ... None of this garbage makes sense. ... a cheesy sword-and-sandal flick that tries too hard to impress. 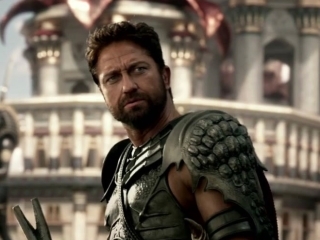 Though this movie is about Gods of Egypt, most are hardly seen past the first 10 minutes or they are so thinly written that it's amazing they weren't consumed by their own character holes. . .
[It's] not satisfied with being your average forgettable blockbuster. No, it wants to be something much worse: a big-budget disaster whose existence is meant to lull those unfortunate few watching to sleep, only to shock them awake in a fit of rage. It was jarring, distracting and hilarious to watch, almost like being in a very sandy fun house. Not funny enough to laugh at, not pretty enough to look at, and not serious enough to care. Like, "what the devil were they thinking?" bad. [Gods of Egypt] wraps a cheesy storyline within yards of gaudy spectacle. It clearly seems to have been made with the desire of making something of quality that just fails spectacularly, and there are definitely some unintentionally laughable moments -- actually a lot of them.